Your guide will pick you up at your hotel or meet at a central eastside Portland point by 8 a.m., and will greet you with coffee or tea and a bike fitting. 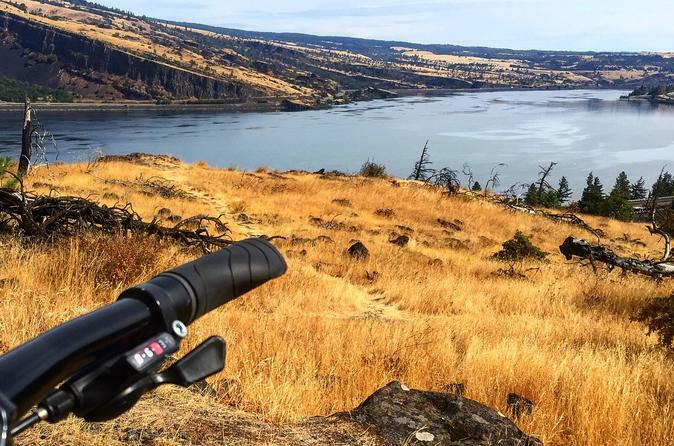 Your guide will load your bikes in a comfortable Sprinter van or SUV and head out toward the western edge of the Columbia Gorge. You and your group will take a scenic stop to introduce you to the geology and microclimates through which you'll shortly be riding. While your guide unloads your bikes, grab photos of the vistas before you don your helmet; then ride down the thrilling, magical curves of the Historic Columbia River Highway. You and your guide will ride three to six miles and take short hikes to three waterfalls, including one of our favorite in the Gorge -- Latourell Falls, a stunning plunge-style waterfall with a backdrop of cathedral-like columnar basalt -- before your guide loads the bikes back on the van. If your group hasn't yet visited Multnomah Falls, you'll take a quick stop to get our favorite perspective of this stunning landmark, the tallest in Oregon, before driving to a picnic spot with a spectacular view (in inclement weather, indoor lunch options are available; we are happy to ride rain, shine or wind!). After a vegetarian lunch, you'll head east past the rugged wind surfing town of Hood River to what we call a wildlife playground, the far more arid Garry oak-covered ridges and sinuous hills of the Eastern Gorge. Your guide will get the bikes out again and you'll ride five to nine miles. You'll get an opportunity to see the shape of landscape exposed far more clearly without the lush forests and ferns of the Western Gorge, and ride the stunning S-curves of the most beautiful, and little-used, part of the Historic Columbia River Highway, modeled after what is considered one of Europe's most amazing roads, the Axenstrasse of Western Switzerland. At the end of the ride, you and your group will drive back to Portland. Your professional guide will provide historical commentary and conversation throughout the day, as well as telling you stories about native legends and giving you the opportunity to renew yourself with what one of our favorite zen bicyclists calls "mindful riding." You'll be returned to your hotel, or the central Eastside, at the end of the journey.